Chessie 3/4 Sleeve Cardi https://www.review-australia.com/au/chessie-3-4-sleeve-cardi-6/RE15KW018.REWHT001.html The classic Chessie 3/4 Sleeve Cardigan in Black is the perfect cardi for any occasion and a must-have wardrobe essential. It features a slightly cropped length with a wide hem band, cute embossed dot details, and buttons dyed to match perfectly. Monogram me for $25! Please note as monogrammed items are bespoke we cannot accept exchanges or refunds. The classic Chessie 3/4 Sleeve Cardigan in Black is the perfect cardi for any occasion and a must-have wardrobe essential. It features a slightly cropped length with a wide hem band, cute embossed dot details, and buttons dyed to match perfectly. Monogram me for $25! Please note as monogrammed items are bespoke we cannot accept exchanges or refunds. Chessie 3/4 Sleeve Cardi is rated 4.9 out of 5 by 124. Rated 5 out of 5 by happyontheinside from Perfect Cardi! When I first tried on my 3/4 sleeve black cardi in store, it was love at first wear! I own a number of 1950s-inspired dresses, and for years I have been searching for the right little black cardi to wear with them. The Chessie is cropped, and perfectly fitted, allowing me to show off the lines of the dresses I love, and at the same time add to my style. It is well made, the fabric feels lovely, and it is versatile and stylish. Highly recommend! Rated 5 out of 5 by Vettispaghetti from Versatility, comfort, best knitted fabric!! Adore this as it goes with everything! Dresses, pants, Top and skirt...with any and every colour or floral....it's a perfect quick ho to cardi when I'm not sure about the weather and I'm in a hurry...great with a brooch too! So happy I purchased this one...it even looks fab draped over my REVIEW bag handles...I saw it and bought it....Love at first sight! Rated 5 out of 5 by Mell1e from A staple item for every Review Girl This is the second time I have purchased this item the first has lasted quite a few years but I decided to add another for this winter to minimise washing. 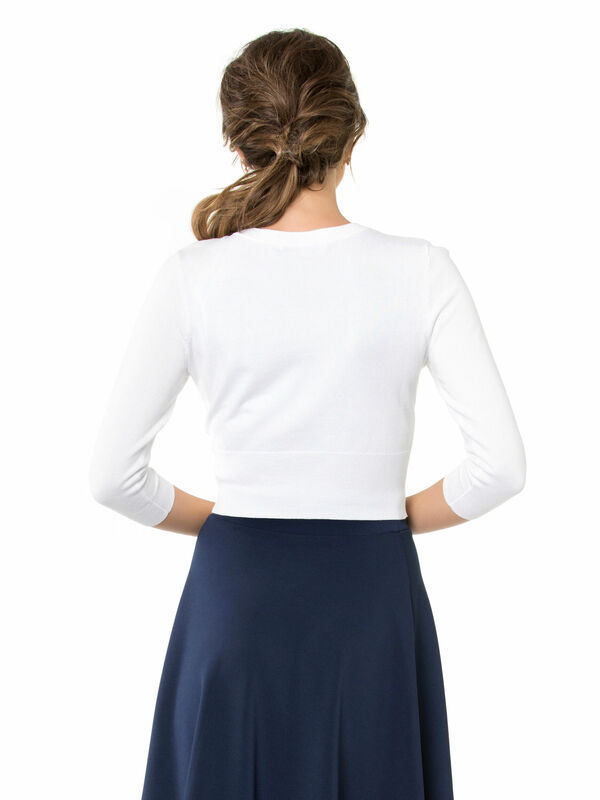 The Chess 3/4 sleeve Cardi in white is such a staple item of clothing for every Review Girl's wardrobe. It it stylish and goes so well with so many Review dresses. Rated 5 out of 5 by simbel from One more perfect cardigan The Chessie is the perfect cardigan if you need something that goes with any outfit, any time, wears beautifully and lasts for years. I have quite a few of these now, and always try to expand the colour range in my wardrobe. The red is a lovely, classic true-red shade that goes wonderfully with red lipstick. Rated 5 out of 5 by PammyT from Quality Cardigan I tend to be sceptical of reviews particularly when the company offers a reward for leaving reviews. However in this instance this cardigan is as great as everyone else recommends. It’s versatile & a great quality. I’m a size 8 normally but found had to go a size up a size as it runs a little small. Rated 5 out of 5 by ainsleighb from Perfect Fit I've been waiting for the navy cardi and jumped on the 30% off sale, with a voucher that I also had. It matches in with a couple of my skirts that have a navy base, and a couple of dresses as well. The Chessie's are a staple in any Review Lovers wardrobe, and I'd recommend to all.